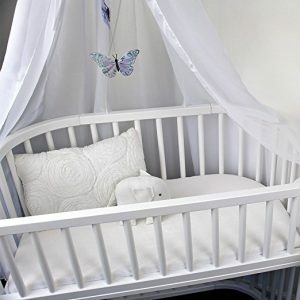 While many parents choose to let their baby sleep in a crib as soon as they leave the hospital for home, there are some who would prefer a bassinet for their little one's first few months of sleep. Why, you may ask? 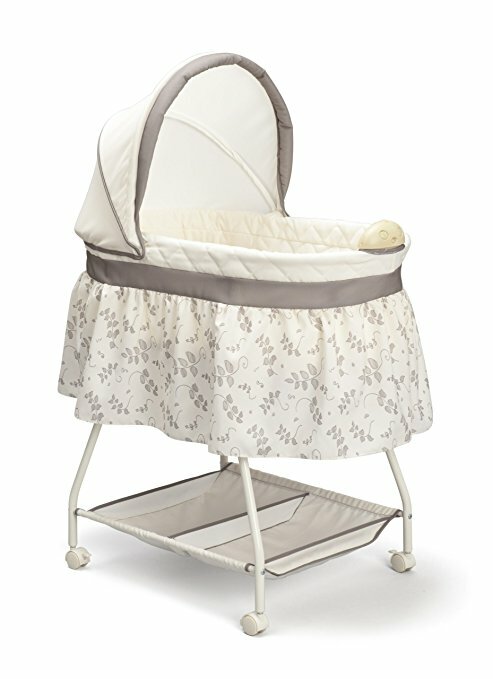 Bassinet is the best co sleeper for parents to attend to baby's needs immediately without having to move across rooms. This is much appreciated especially for those midnight feeds and diaper changes. Besides, it is more portable than cribs so it is easy to be moved across places, including trips to grandma's house (travel crib is another option). 1. Do You Need A Bassinet? For the first few months, at least before baby is able to roll around or sit up on his own, you will want to co-sleep with baby. This is so that if there's anything, you can access to his needs immediately (especially if you have a preemie) and studies have found that co-sleeping reduce the risk of SIDS. Sure, you can rely on baby video monitors but still, you will need to walk to the nursery (multiple times a night) and this can be rather painful. This is when a baby bassinet becomes handy. 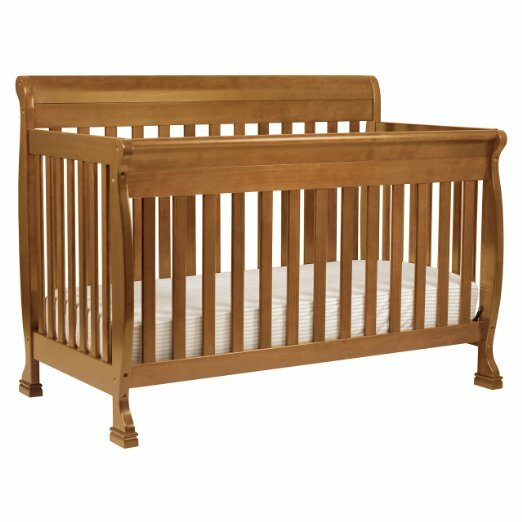 It is the best co sleeper crib in that you can place it right beside your bed to attend to your baby's needs quickly and easily. 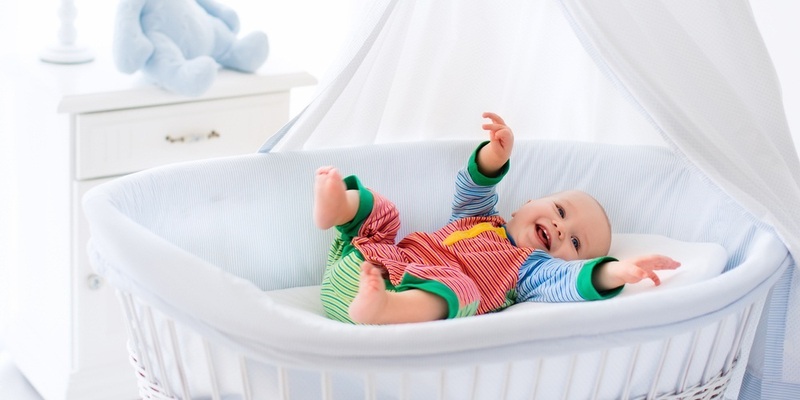 Sure, you don't necessarily need a bassinet to do so - if your bedroom is big enough to store a full-sized crib, by all means, stick to one - but if you're like us who live in an apartment, or simply do not have enough space in the bedroom, then the best bed for newborn is a bassinet. Below is a list of the top bassinets we have tested and reviewed. Each has their own plus point different from another, as such, the following baby bassinet reviews are not rated in chronological order. 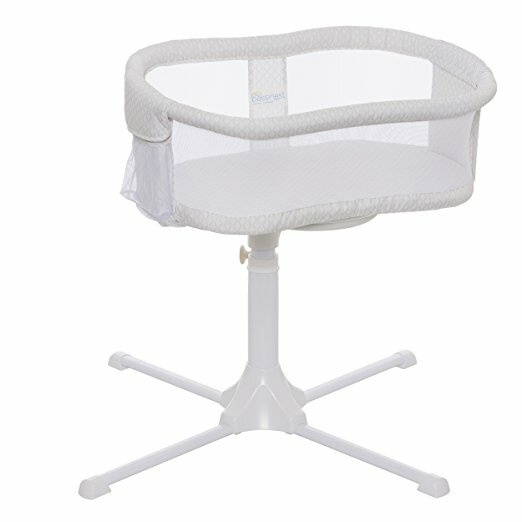 Choose the features you most need and it will be the top baby bassinet for you! Among all top rated bassinets, the SwaddleMe By Your Bed Sleeper is by far one of the best bedside bassinet. 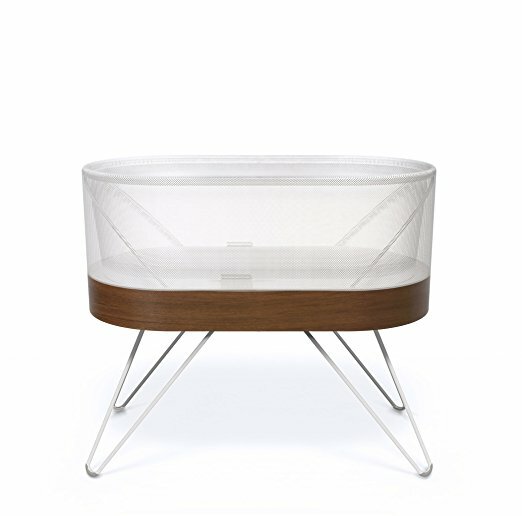 This sleek bassinet has a height-adjustable frame for you to adjust so that you can have baby lay at the same level as you, while s/he still have his own safe space to sleep in. Don't worry, the legs will slide underneath your bed so that your bassinet can really be right next to your side. It is also one of the best rocking bassinet because it comes with a side-to-side rocking feature for you to soothe baby without getting out of bed. If that's not enough, it also comes with a portable clip-on soothing unit that includes 2-speed vibration, lullabies and nature sounds (no need for these! ), and soft-glow nightlight. 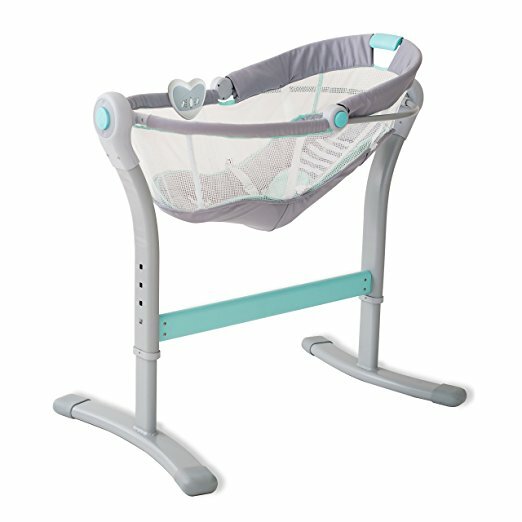 We like how it has 2 incline positions so that baby's head can be safely elevated for easier breathing, better digestion and overall a more comfortable sleep. You can slowly transition him into flat sleeping by gradually setting the incline lower in preparation for the crib. Overall, the SwaddleMe By Your Bed Sleeper is one of the best co sleeper bassinet (also very affordable!) to have baby close by your side during the first few exciting (but exhausting) months. Definitely recommend! 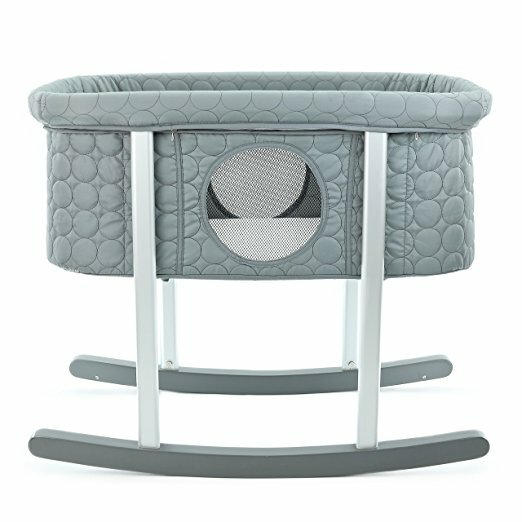 For those looking for the best portable bassinet, look no further - the Delta Children Sweet Beginnings Bassinet is your answer! 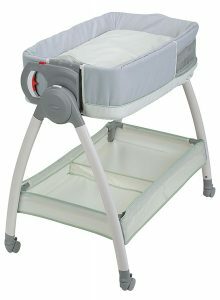 This top rated baby bassinet is made of lightweight steel frame for the ease of mobility and is designed for infants up to 15 pounds. The adjustable canopy allows you to shield your baby from your bedroom light so that you do not need to switch it off each time baby needs to sleep (but you don't, yet). If the canopy is not required (some think it gets in the way during midnight feedings), it can be removed completely. This bassinet comes with four wheels for you to move from room to room easily and they are lockable for security if moving is not required. The extra space at the bottom provides added storage space for your most used necessities so that you do not need to go running to the nursery each time you need, say, an extra blanket or a change of diaper. At such a price (trust us, this is the best affordable bassinet) with such quality, you really cannot go wrong with the Delta Children Sweet Beginnings Bassinet. Truly the best infant sleeper, give your little one a sweet beginning with this one! If you have a bigger budget, the Graco Dream Suite Bassinet is another one of the best portable co sleeper that you can consider. 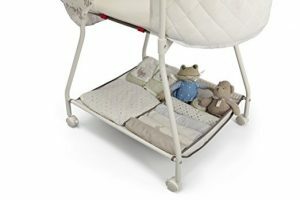 Very similar to the Delta Children Sweet Beginnings, this bassinet also has 4 lockable wheels for effortless manoeuvring across rooms in the house and has two integrated compartments at the base for storing baby's essentials. Likewise, it comes with a canopy to block lights off and has two soft toys to give baby a focal point for playtime. The biggest attraction, and also reason why we think it is one of the most ingenious and considerate design, is that it also incorporates a changer all in this one bassinet (you can delay getting that changing pad a lil longer!). With a simple push of a button, the bassinet will reverse to reveal a changer pad at the bottom for you to do the dirty deed (pun intended). 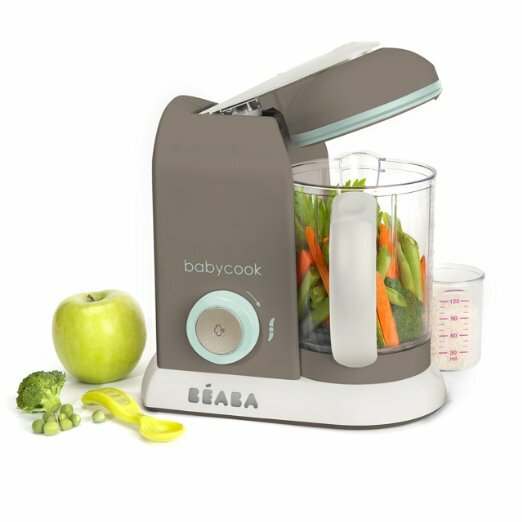 Even if your little one has outgrown the bassinet (15 pounds), the changer is still usable as it accommodates up to 30 pounds. As you know, babies need to change their diaper multiple times a day. This 2-i-1 design allows you to do just that anywhere you are in the house without the need to rush to the nursery each time a change is required. If this is not the best portable bassinet, what is? The only downside is that some parents find the Graco Dream Suite Bassinet a little hard to assemble, but this is understandable because you are putting together a 2-in-1 mechanism after all. Once done and dusted, you will appreciate all the convenience this best co sleeper for newborn brings to your life! 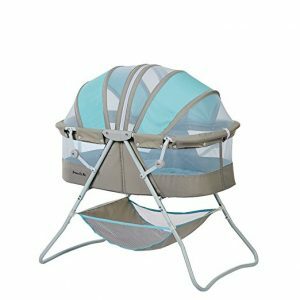 In terms of portable bassinet reviews, we cannot miss out this Dream On Me Karley Bassinet. 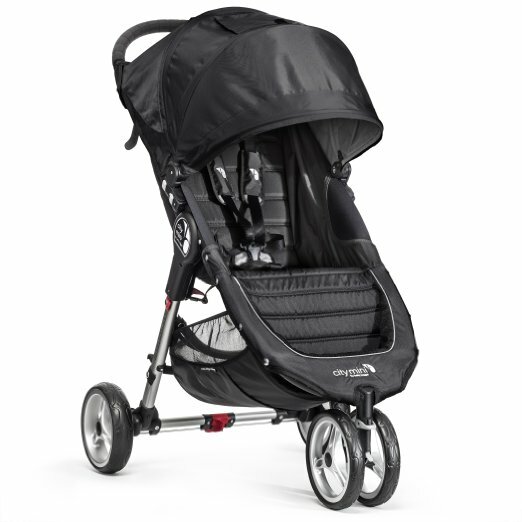 Weighing just slightly over 14 pounds, it is light to be carried to practically anywhere. Also a bassinet with storage underneath, this is a type of covered bassinets for babies. Such weight is made possible due to the use of lightweight aluminium in its construction and pair with the quick-folding mechanism, you can easily bring this from room to room or even for night outs at grandma's. 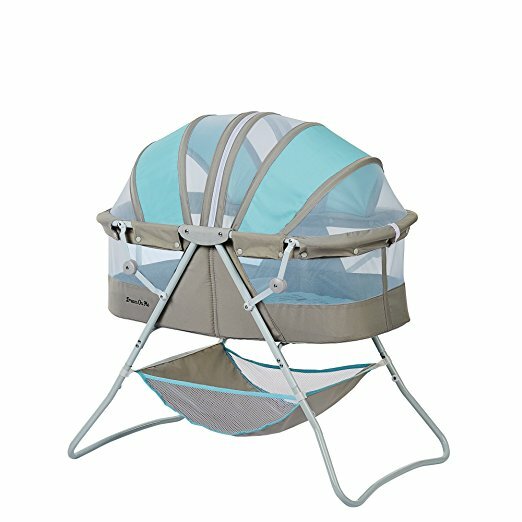 Compare to the previous two bassinets above, the Karley can accommodate infants up to 25 pounds so you'll get longer use with this top rated co sleeper. We especially like the double canopy that can be zipped up completely to keep curious pets from jumping into it and disturbing your baby. If the Graco Dream Suite Bassinet sounds a tad too hard for you to assemble, this one will be right up your alley as assembly does not require more than 1 minute. It may not have the dual function as that of Graco's, but it still has a sizeable storage bag at the base for you to keep your essentials close by and lockable casters are incorporated too for ease of mobility. Being one of the best rated bassinets in the market, the Dream On Me Karley Bassinet is one co sleeper that you can trust. It comes in a few different colours, there's bound to be one that fits your preference and/or room aesthetics! The portability of the above three bassinets may still be insufficient if we're talking about overseas travelling as they can be too bulky to pack. 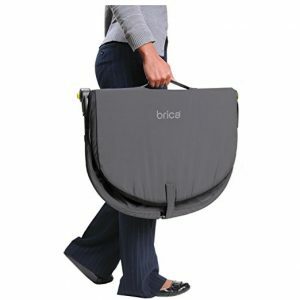 For such purpose, you need the best travel bassinet - the Fold N' Go Travel Bassinet from BRICA. 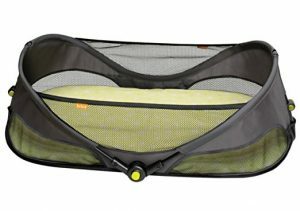 As you can see from the picture on the left, this bassinet folds flat for easy storage. You can even fit it in a suitcase, otherwise, the convenient carrying handle makes it simple for you to carry it anywhere you go. Don't worry, it weighs less than 3 pounds so it won't cause you a strain in the muscle. This bassinet is a dream to set up. 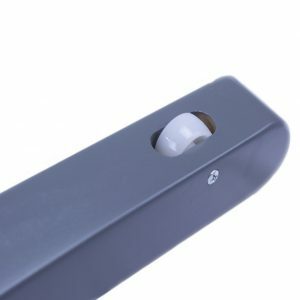 Its sturdy frame locks with an audible click at four different points to let you know it is ready to use. Once you're done with it, simply press the release button and you can fold it up completely. It won't take you more than a few seconds! The double locking tubular steel frame is strong and durable and this updated version with mesh panels provide air flow for maximum comfort, not to mention it gives you full view of your little one inside. Breathable fabric ensure your little one is comfortable, and the removable, water-resistant mattress pad and fitted sheet set are also high in quality. The BRICA Fold N' Go Travel Bassinet is not limited for overseas travelling only - we know of parents who love its portability so much, they bought one so that they can set up nap-time for their little one anywhere, anytime without having to plan their day around it. If you're a fan of picnics, beaches, cross-country adventure or heck, even just having coffee with friends, this is the best bassinet for you! We know you're waiting for it, our take on the HALO Bassinest Swivel Sleeper Bassinet among all the halo bassinet reviews out there. Where shall we start with what is being dubbed the 'best newborn sleeper' ever? First off, and also the brand's biggest selling point which we're sure is covered by most bassinest reviews, is that this is the only bassinet in the market that rotates 360 degrees. 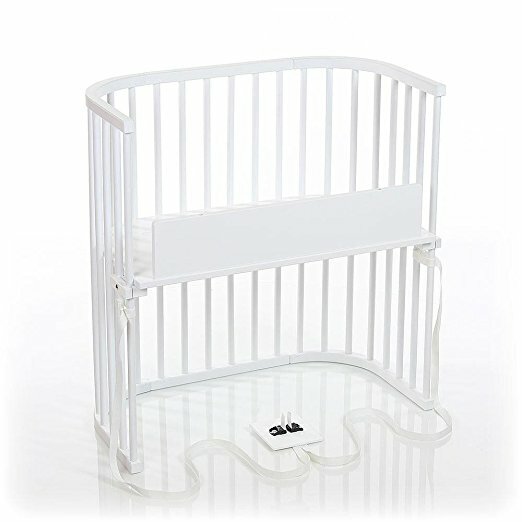 This allows parents to swivel it in any direction they want to suit their convenience, and it makes getting in and out of bed so much easier without the bassinet getting in the way. This is also one bassinet that lets you bring your baby sleep close to you (basically just right next to you) but with him still having his own safe space thus reducing the risk of co-sleeping. 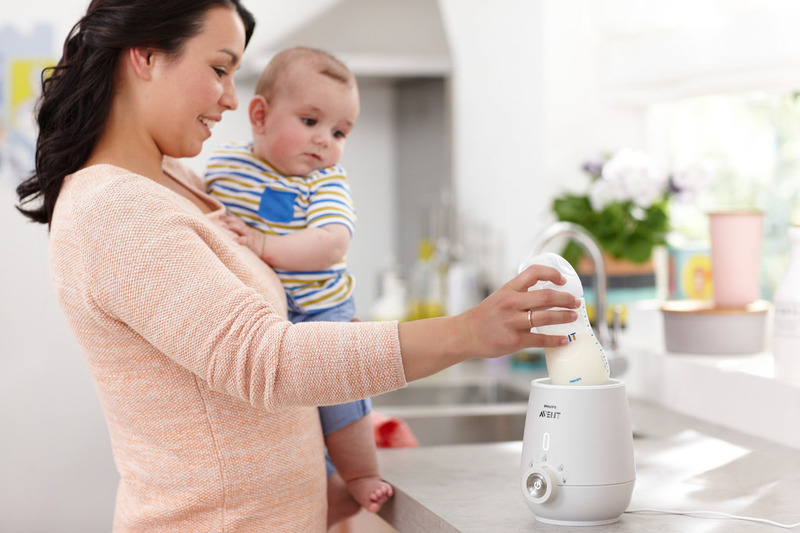 What we really like is that the side wall can be lowered for easy tending of baby, and it will automatically return to its upright position so that you don't have to worry about forgetting to pull it back up each time. If desired, you can even lock it in upright position for maximum security. The mesh side walls allows better breathability, besides giving full visibility of baby inside. 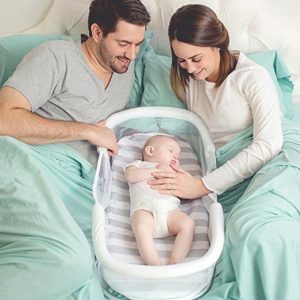 All these features make it hands down the best bassinet for c section, or basically for all recovering mothers with limited mobility and nursing mothers because you literally do not have to get out from the bed to tend to your baby. This is also the best bassinet for small spaces because it has a small footprint, and the base can be tucked under the bed for maximum space-saving. The HALO Bassinest Swivel Sleeper Bassinet has been recommended as one of the safest alternatives to bedsharing by the CJ Foundation for SIDS. It is not the cheapest, but for the best baby co sleeper, we think every extra penny is worth the investment. 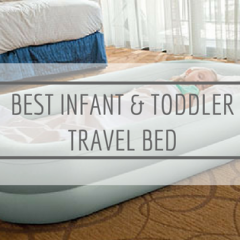 Click here to read more of our in-depth review of this best co sleeper! 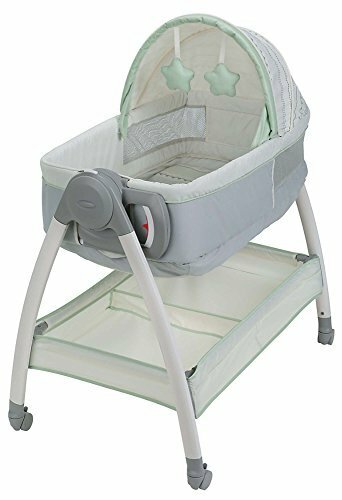 Another best bassinet for newborn is this one from Green Frog - it is one of the rare few which accommodates beyond the common 15 pounds that most bassinets offer, so this is one baby bassinet that gives you better longevity. Made of light aluminium, it is light and easy to move around as it comes with wheels. Just lift and glide on the custom designed wheels and you can move it from room to room easily. The low height and transparent mesh side windows ensures that you always have a view of baby and you can reach in easily to tend to his needs. Parents can choose to rock this bassinet themselves, or if that's too much hassle or you have other things to do, this is also one of the best self rocking bassinets. The modern curved wood design allows baby's own movements to gently rock itself back and forth smoothly without getting stuck in any position. It is definitely one of the best baby cradle to soothe your little one. For those looking for the best baby sleepers that are easy to carry around, you won't go wrong with the Green Frog Bassinet/Cradle. Both taking apart and assembling is a dream with its snap-on legs and and rockers, and it also comes with a carry bag for on-the-go. Onto the more luxury bassinet reviews, this Bedside Sleeper by Babybay is the best co sleeper attach to bed you can find in the market. Although bassinets like HALO and SwaddleMe are basically next to your bed already, they are not as attached to your bed as the Babybay. This bassinet lets you fit flush and secure according to your bed height, thanks to its wide and fully height adjustable sleeping platform. Recommended by lactation consultants, you can rest assured this is the best bassinet for breastfeeding (formula feeding is suitable too). The modular design allows you to transform this co sleeper into a standalone, mobile bassinet (conversion kit bought separately) and you can raise the platform to create a changing table. And if you put two Babybays together, you get a full-sized crib or playpen. While the Babybay is certainly on the expensive side, we think its price is justified. Besides all the amazing features reviewed above, it is also made from sustainably-sourced beech wood that offers antibacterial and antistatic protection. 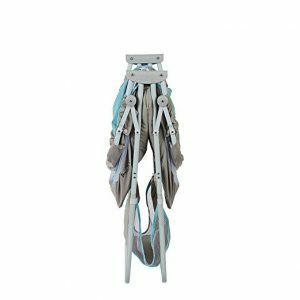 It is the best non toxic bassinet in that only high-quality and non toxic water-based finishes is used so that your baby can sleep in a safe and healthy environment. Made in Germany, you know it adheres to the highest European quality standards. Now onto the king of luxury bassinets - the SNOO Smart Sleeper by Happiest Baby. This is the best infant bassinet that actually boosts sleep and calms baby's fussing by quickly responding with special white noise and jiggly rocking. Being one of the best self rocking bassinets, it gently rocks to help your baby be a better sleeper. In fact, over 200 babies have been tested with results shown to have less crying and more sleep - it even reduces the need for sleep training! 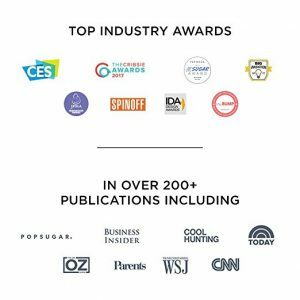 Bagging multiple top industry awards with more than 200 publications in renowned medias, SNOO is the safest and most effective baby bed ever made. Its unique 5-second swaddle is easy to use and keeps baby securely safe on the back all night, preventing any rolling over. Babies have found to have quickly developed healthy sleeping habit with the SNOO. Now, we have to warn you, this is no best cheap bassinet - you'll probably get the shock of your life seeing the price tag. It's certainly not one for everyone, but if you can afford it, the SNOO Smart Sleeper is really the creme de la creme, the best baby bassinet that offers new parents the precious gift of rest and peace of mind. Don't get confused, although similarly named, this SwaddleMe is to be placed by your side, not by your bed. For those that want to enjoy the benefits of co-sleeping but do not want to splurge on a bassinet that can be only be used for 6 months or so, the SwaddleMe By Your Side Sleeper is the best in bed co sleeper for you. 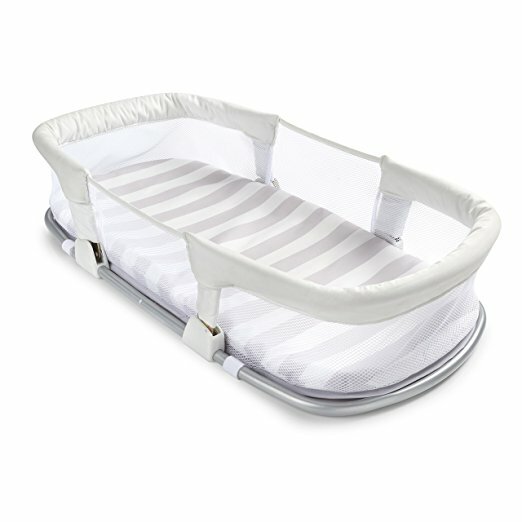 A bassinet under $50, this co sleeper allows you to sleep with baby safely on the same bed without risking any SIDS. The steel frame creates a safe barrier around baby, protecting parents from rolling over and the all-around mesh sides ensure your little one is not overheated. Don't worry, the side walls are compressible so that you can reach your newborn easily and conveniently. Because the sturdy frame folds flat, the SwaddleMe By Your Side Sleeper is also one of the best infant co sleeper parents love to bring for travels. It is practical, economical and is the bassinet for small spaces, perfect for those who do not want an extra item in their room for just 6 months or so. If you do not mind paying a lil extra, you can get the Deluxe version which comes with addition features like lullabies, vibration, nature sounds and soft-glow nightlight. Bassinet is the best co sleeper for parents to attend to baby's needs immediately without having to move across rooms. This is much appreciated especially for those midnight feeds and diaper changes. Compare the best baby bassinets in the market and find the best bassinet deals for this Black Friday and Cyber Monday! The HALO Bassinest Swivel Sleeper Bassinet has been recommended as one of the safest alternatives to bedsharing by the CJ Foundation for SIDS. It is not the cheapest, but for the best baby co sleeper, we think every extra penny is worth the investment.